If you would give just about anything to dodge the dreaded “what are we doing today?” question from bored kiddos this summer, you’ve come to the right place. And lucky for you, the Des Moines area offers so many different day camp options that there’s sure to be a program that’ll keep your tots and teens blissfully occupied until school starts back up again. Take a look at some of the top summer day camps across the DSM area below, and check out our Summer Camp Guide for more awesome ideas. Note: This is a working list, so check back often for new listings. 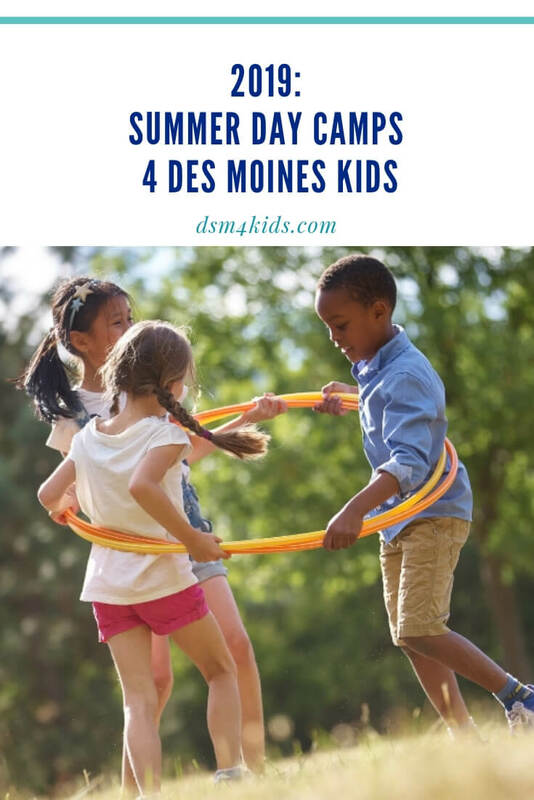 If you know of a summer day camp camp that you would like to have included to this guide, please email the listing information to nicole@dsm4kids.com or leave a comment below. dsm4kids does NOT host any summer camps. Please contact the specific venue or organization hosting the camp for additional information and to register. Their summer camp programs run from 9:00 am to 4:00 pm, with early drop-off available as early as 6:30 am and late pick up until 6 pm, Monday through Friday. They provide breakfast and lunch options as well as an afternoon snack. Programming changes yearly and there’s always something new and fun. Ankeny Community Schools is gearing up for a fantastically fun and engaging summer with their Summer Adventures Camps. They have some fun themes in store and the day camp offers a safe, fun, high-quality, hands-on enrichment and summer of fun. Camp Fire Heart of Iowa offers several day camp options in the Des Moines area. Camps are offered to kids in grades 1-10 from 7:00 am to 5:30 pm, June 3 through August 16, 2019. Options include Discovery Day Camp, Riverview Day Camp, Equestrian Day Camp, Riverview Day Camp, Hantesa Day Camp, Hantesa Outrageous Day Camp, Des Moines Outrageous Day Camp and Pioneer Columbus Community Day Camp. Clive Parks and Recreation offers their Fun, Sun and Splash Day Camps from June 3 through August 16, 2019. This all-day weekly adventure starts and ends at the Special Events Building. Your child will be involved in daily activities of games, arts and crafts, sports, field trips, guest speakers, and movies, with afternoons at the Clive Aquatic Center. Looking for some fun for your children this summer? Have them spend the summer with friends going on field trips and exploring all the fun Des Moines Christian School’s campus has to offer. For kids for ages 2-12. DMPS offers a wide range of opportunities for students and families throughout the summer. Yes, it may soon be summertime, when the song says the “livin’ is easy”, but in this school district the activity level is high as, on any given day, thousands of students are taking part in a wide variety of programs at schools. Engman Camp Shalom is sponsored by the Jewish Federation of Greater Des Moines and is a day camp where kids find fun and friendship, while also exploring their interests and discovering new experiences. Located in Waukee, programming is offered June 10 through August 16 from 9:00 am to 4:00 pm. Available for kids entering kindergarten through 7th grade. SAS Summer Camps are held at Summit Middle School from 7:00 am to 5:30 pm., offering daily breakfast, social and game time, field trips, and afternoon snacks. Students can sign up for one of two camps offered each week – an active camp or an enrichment camp. All camps offered throughout the summer will touch on a wide range of interests. You do not need to be a member to keep your kids active all summer long during the Life Time Kids Summer Camp. Your kids will experience an amazing summer with a different theme every week. That means your kids will enjoy everything from rock climbing to arts and crafts to fun field trip days.Even better? With convenient 8:00 am to 6:00 pm hours, it’s perfect for working parents’ schedules, too. For registration and questions, contact The Activities Desk at (515) 362-3551. The summer child care program at New Horizon Academy, Camp Discovery, is your child’s passport to a summer of fun, friends, and field trips. Summer at New Horizon Academy provides your child a safe environment to learn, play, and explore during those happy summer days. With their fun summer themes, your child will engage in engineering challenges, science experiments, art exploration, STEAM investigations, the arts, and so much more! Contact your local New Horizon Academy to learn more and register for their Camp Discovery program. This summer day camp program is housed at the Norwoodville Community Center located at 3077 NE 46th Avenue in Des Moines and provides supervised recreational and educational activities for youth ages 6 through 13. Fees are assessed on a sliding scale according to a family’s gross household income. All fees charged cover morning and afternoon activities. Registration typically opens the beginning of May. Prairie Life Fitness Youth Programs is committed to providing an educational and fun filled summer to youngsters ages 3-12. They offer full day camps starting weekdays, June 3 through August 23, 2019. Each week a new theme will be the focus of learning and tons of fun. They incorporate arts and crafts activities, group games, snack, and swim time daily. Pick and choose or sign up for the whole summer! Summer Camp is offered to both members and non-members. A medley of summer fun is to be had at Sapphire Gymnastics, with a wide range of activities intended to keep kids active and engaged all summer long. Each week is a new theme with several activities planned each day. Field trips to local parks, pools and attractions are also included. Day Camp is from 7:00 am-5:30 pm Monday through Friday, for kids ages 5-14, June 3rd to August 16th, 2019. Triad offers full and half day summer kid care. Day campers go on three field trips each week including swimming every Wednesday. They also have gym time in their beautiful air-conditioned facility, age-appropriate themed activities and fun time on their huge inflatable Slip ’n Slide and other inflatables. Through their Adventuretime Program, Urbandale Community School District offers summer programming for preschool through fifth-grade students. Day campers will have the opportunity to participate in crafts, games, literacy and math activities, science enrichment activities, team building, field trips, guest speakers, and weekly celebrations. Registration typically opens the end of March. Waukee Community Schools provide summer programming through Beyond the Bell. This summer day camp keeps children active, encourages them to be creative, develop great friendships and have fun. Each week will have a theme with corresponding crafts, activities and field trips. Registration opens Monday March 4, 2019 and will run through Sunday, March 31. Summer Day Camp is offered during the summer months for children who have completed grades K-6. Kids West Summer Day Camp offers many field trips during the week to help instill children with a curiosity about their world. Registration typically opens in March. Day Camps are offered through several of the Y’s branches and at multiple locations throughout central Iowa. The Ankeny Family YMCA, Indianola YMCA, John R. Grubb Community YMCA, South Suburban YMCA, Walnut Creek Family YMCA, Waukee Family YMCA and Wellmark YMCA offer various camps. Some branches also have off-site locations which allows them to hold multiple camps simultaneously. Be sure to check out your school’s before or after school care program and community education offerings, as well as, with local parks and recreation departments. What is the best summer day camp your kids have ever been to in Des Moines? Let us know in the comment section!